The Galaxy S7 Oreo update has been taking its sweet time to make its way to Galaxy S7 and Galaxy S7 edge owners, who have been getting more and more impatient as the months have gone by. Samsung released the Oreo update for the Galaxy S7 and S7 edge a month ago in the UK, halted its rollout to fix a serious issue, then resumed soon after, but the company has been quite slow at expanding availability of the update to other regions. For those in Sweden and other Nordic countries, though, the wait is now coming to an end, a week after Samsung released Oreo for the Galaxy S7 in its home country. We have received tips from a couple of users who say the update is available in Sweden. Samsung usually releases major updates to countries in the Nordic region around the same time, and there’s no reason that won’t be the case this time around as well. Only the Galaxy S7 seems to be getting the update right now, but the Galaxy S7 edge is likely to join the party soon. It’s a 1.2 GB download that gets you the new Samsung Experience 9.0 UX (though not every feature from the Galaxy S8 and later flagships is included). 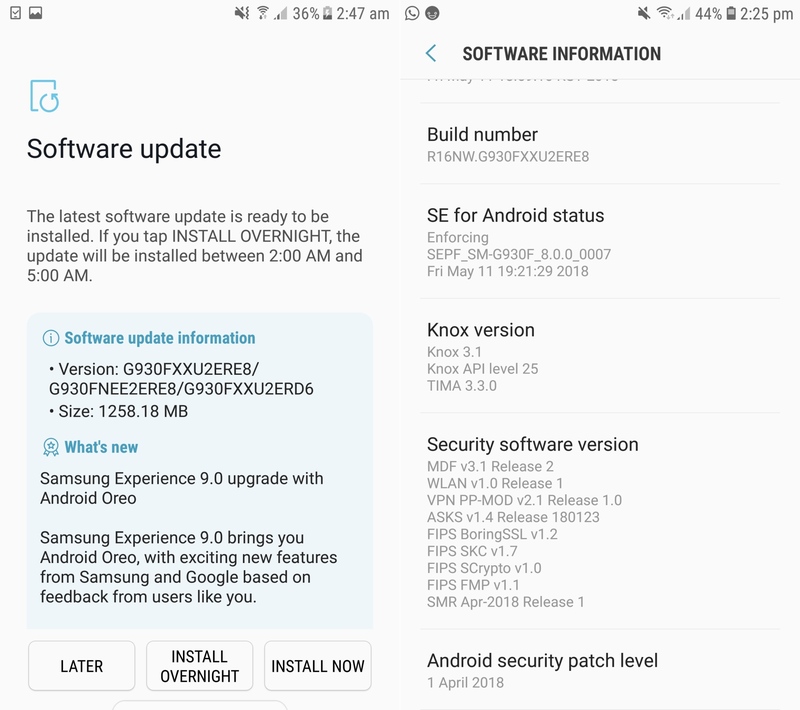 The build number is G930FXXU2ERE8, the same as the update that released for the UK earlier. The security patch date, meanwhile, is April 1. Have you received the Oreo update on your Galaxy S7 or Galaxy S7 edge? Let us know by leaving a comment; do tell us your country as well, and if you haven’t already, you can check if the update is available by going into the Software update menu in the phone’s Settings app. Update: The Galaxy S7 edge has also started receiving the Oreo update for the Nordic region. We have added firmware for both devices to our database as well (Galaxy S7 | Galaxy S7 edge), so you can upgrade manually if you can’t get the update over the air. Oreo is available in Russia. Stop. When did you get oreo? Today or one month ago? News in Germany: OREO for S7 DBT now available. It would be great if SEE region gets it tomorrow. How do you know it started testing today? I check the Samsung Fota cloud servers links that show traces of what is being tested for what devices and regions. I’m not allowed to post links so you got to Google Samsung fota cloud servers in xda developers. Ni forzando la detención de Marcos de servicio de Google y reiniciado el dispositivo, s7 edge. Received the update on my G935F DBT in Germany. No Bixby, but Dual Messenger. Working fine so far, but only April security Patch. I’m sick of waiting for oreo update of my s7 edge (SM-935FD). Why would the one of the popular smartphone brands took it’s so long on phone update’s. I live in Malaysia and the updates is only for SM-935F model and just for 2 country? You should hire more workers if you don’t want to lose your smartphone fans. Shame on you. Will it have the Dual Messenger option as in the latest Samsung flagships? Nothing for Brazil yet. This is the slowest update ever. It seems they do it on purpose so that people go out and buy their new phones instead of waiting so long for the new android. Next year people with the S8 will have to cope with the same thing. Alguien sabe de fecha oficial para Oreo s7 edge en España.